he team's project named Caeli is an automated Anti-Pollution and Drug delivery mask that leverages Microsoft Azure's Machine Learning to help patients suffering from asthma and other chronic respiratory conditions. After competing with 11 other teams from across the region, Team Caeli from India won the Asia Regional Finals of the 2019 Microsoft Image Cup challenge. The team's project named Caeli is an automated Anti-Pollution and Drug delivery mask that leverages Microsoft Azure's Machine Learning to help patients suffering from asthma and other chronic respiratory conditions. With this win, Team Caeli received $15,000 and a spot at the Image Cup World Championship. 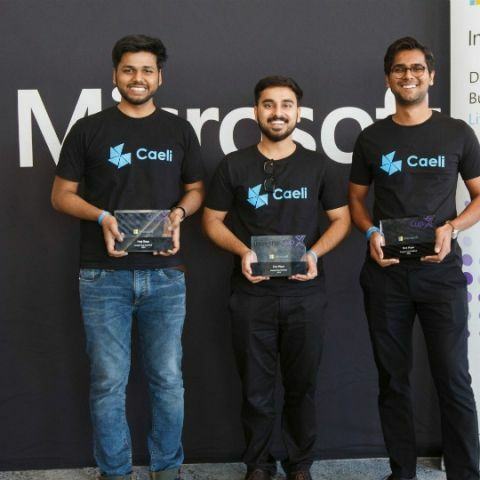 Microsoft today announced Team Caeli from India as the winner of Imagine Cup Asia Finals, after a high-strung finale against 11 other teams from across the region. Team Caeli won over the hearts of the judges with their smart automated Anti-Pollution and Drug delivery mask specifically designed for patients that are suffering from asthma and other chronic respiratory conditions. Caeli implements breakthrough features that will improve the quality of life for respiratory patients living in polluted areas. The first runner-up and second runner-up places were awarded to Team RailinNova from China and Team AidUSC from the Philippines, respectively. Team RailinNova developed the Rail Component Inspection Robot, which determines and identifies rail defects through multi-sensor monitoring. The solution strives to help railway companies to solve any issues more efficiently, and more economically. Team AidUSC came up with Aqua Check, a water contamination mobile application that enables detection of contamination by taking a photo of a water sample through a microscope. Team Caeli received USD15,000 and will continue their journey at the Imagine Cup World Championship, which will be held in Seattle in May. First place team at the World Championship will win USD100,000, USD50,000 Azure grant, and a mentoring session with Microsoft CEO Satya Nadella. This year, 12 finalist teams from 10 countries competed in the Asia Finals. The countries included China, India, Indonesia, Korea, Malaysia, New Zealand, Philippines, Singapore, Sri Lanka and Thailand. These teams were selected from various rounds of the competition online or through in-person National Final events organized by Microsoft subsidiaries in countries across the globe. Held annually since 2003, the Microsoft Imagine Cup is the world’s premier student technology competition, affectionately known by participants as the “Olympics of student technology competitions”. This year’s Imagine Cup encouraged participants to “Dream it. Build it. Live it” in order to create applications that shape how individuals live, work and play and through their creativity, passion and knowledge of technology. For more information about Imagine Cup, please visit https://www.imaginecup.com/.